H.O.M.E. has initiated its Medical Media Ministry, which involves the preparation of TV programs in which H.O.M.E. experts in medicine discuss in Arabic a medical disease and then that disease is used as a spiritual illustration with a spiritual message. Christian Arab Satellite TV stations (such as SAT 7 TV and Al Karma TV in the USA) routinely air these TV programs on a weekly basis to approximately 40 million viewers in the Middle East. The future plan is to continue to air these medical evangelistic programs under the HOME Medical Media Ministry through various Christian broadcasting networks in the Middle East, Europe, and North America over the next five years. This H.O.M.E. project involves the preparation of Arabic, medical TV programs in which H.O.M.E. experts in various fields of medicine discuss in Arabic a medical disease and then that disease is used as a spiritual illustration with a spiritual message. More than a hundred (100) TV programs have been completed already in collaboration with Al Karma Arabic Christian TV dealing with many other medical/spiritual illustrations to cancer, Hepatitis C, influenza, tuberculosis, child birth, blindness, HIV, depression, addiction, fear, etc. 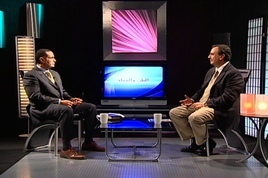 Dr. Maher Samuel, an expert psychiatrist in the Middle East, serves as the TV programs’ host interviewing with H.O.M.E., Christian expert physicians for each TV program. "HOME reaches approximately 40 million viewers in the Middle East through its Medical Media Ministry." Health Outreach to the Middle East (H.O.M.E.) is a Christian, non-denominational organization that exists to offer physical and spiritual healing to people in need in the Middle East by providing medical care and education. © Copyright Health Outreach to the Middle East. All Rights Reserved. H.O.M.E. is a registered 501(c)(3). Gifts are tax-deductible as allowed by law.